For the past three years, the TurboTax design language primarily existed as a singular system heavily grounded in DIY tax prep. Intuit’s consumer group has built brand recognition around TurboTax as a fast, painless way to take care of taxes. 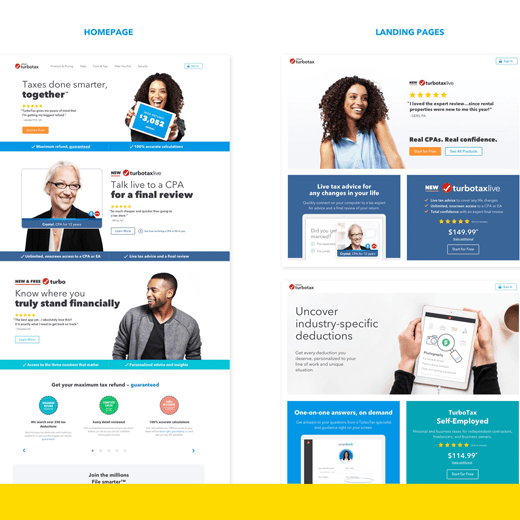 In need of an update, and paired with the business decision to introduce new offerings beyond just taxes, the TurboTax Visual System Redesign developed a completely revolutionized, cohesive system that will purposefully flex along each customer’s unique journey and deliver an innovative experience end to end. Taking an outside-in approach, specific decisions were made based on how customers want to act, feel and behave when engaging with the new and different brands (TurboTax Live and Turbo) during tax season and year-round. The result is a more personalized connection reflected throughout the entire online ecosystem and carried through the in-product navigation experience.